Olympic silver medallist Phillips Idowu is facing a "monumental battle" to win gold in the triple jump at the London Games, says his coach Aston Moore. Idowu's main rivals, Frenchman Teddy Tamgho and American Christian Taylor, have better personal bests. American Will Claye, 20, will also pose a threat to the 33-year-old Londoner. "I believe it will be a monumental battle of will and talent. You hope that Phillips comes out on top," Jamaican-born Moore told BBC Sport. "The fourth place could be a jump that would normally have won the competition, but you could finish fourth this year. "[But] it's an Olympic medal, it's never going to be easy or everyone would be doing it." At the Beijing Games, Idowu's best jump was 17.62m, but he was beaten into second by 17.67m from Portugal's Nelson Evora, who has been ruled out of the London Games by a stress fracture. Since then new faces have emerged in the form of 21-year-old world champion Taylor, who beat Idowu in Daegu in August, world championship bronze medallist Claye and 22-year-old Tamgho, whose personal best of 17.98m is third on the all-time list. "The two American guys are very dangerous," Moore continued. "Sometimes you can have good athletes but you know you've pretty much got their measure. [Yet] these guys are good winners. "I'm almost forgetting the young French guy Teddy Tamgho, who we haven't heard from yet this year but he's been jumping 17.90s for the last two seasons." Idowu, who came out on top against his rivals in his opening competition of the season at the Diamond League meeting in Shanghai last weekend, was devastated after coming second in Beijing and Moore says the 2009 world champion's target has not changed. "The gold - that's what he's preparing for, that's what he's ready for and he will be disappointed with anything other than gold. "He wanted to win the last one but he came second by 5cm. He wants to put that right on home soil. "He's a Londoner, a Hackney boy. I think he's going to love it." 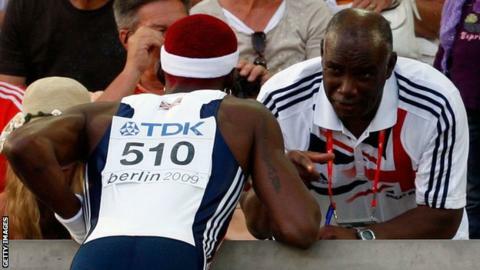 UK Athletics' national triple jump coach Moore, himself a former triple jumper for Great Britain, started working with Idowu a few months before the Beijing Olympics and admits he has seen a change in the athlete ahead of London. "I wouldn't say that pressure is getting to him but certainly with a lot of the athletes, as it's a home Olympics, people are much more focused, and I've noticed that from him," said Moore. "He's much more focused on what needs to be done and how it needs to be done. My job is to make sure it doesn't become over the top and he starts looking at every last detail. I think together we can manage that quite well. "Those five years are his most successful so that makes our relationship reasonably tight because I am the person that has helped him through his best period as an athlete." Moore guided Commonwealth gold medallist Ashia Hansen to a world record and has worked with UK Athletics since 2000, but he admits he will feel the nerves when Idowu lines up for his first jump at the Olympic Stadium in London. "I'm usually most nervous in the first round, because this is the one. This is the one that sets the scene for everything. "I want the jump to send a particular message out to every other competitor. So I'm most nervous about that one because I want him to nail it, and then get better from there. Normally my blood pressure and heart rate and everything jump on that one. "Then, it's work as usual."